Modanisa is a Turkish online retailer offering modest fashion from 200 different brands from 45 different unique designers in 6 different language options in 105 countries. Modanisa was looking for better performance and scalable ad customization tools for their dynamic app install campaigns in 26 countries. They are a highly performance-focused advertiser, especially on Facebook and Instagram, and wanted the best possible CPA for app installs while discovering different audience opportunities. They also faced challenges with customizing ad imagery. They wanted to use different creative styles that work best for each market and their different sales seasons – but were having a hard time achieving this manually. Cross border creative capabilities: Modanisa used Smartly.io's Dynamic Image Templates to create highly personalized creatives for their Dynamic Ads campaigns – customized for each market. The templates were customized further based on the different sales campaigns they run in each market have during the year. Global performance increase and audience discovery: Modanisa used Smartly.io's Predictive Budget Allocation to automatically adjust budgets based on performance. They wanted to improve their CPA and discover different audience opportunities across 26 countries. 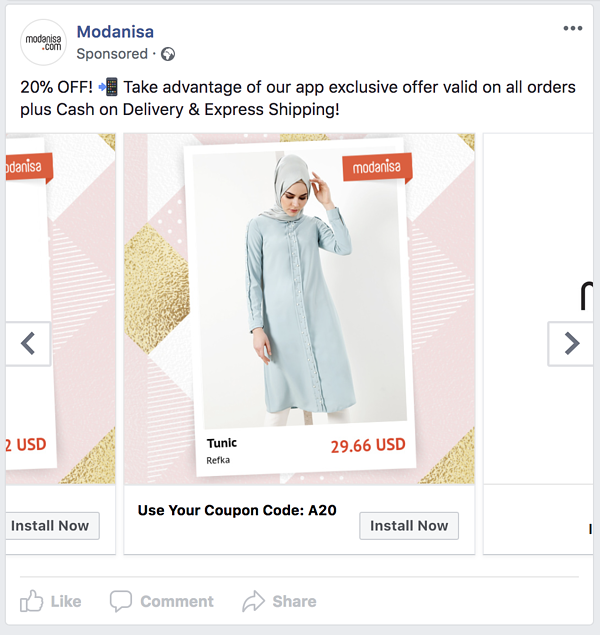 The combination of automated optimization and highly-engaging, customized ad creatives proved to be a winning formula for Modanisa as CPA for app installs decreased by 30% globally. CTR and conversion rate improved by 20%.